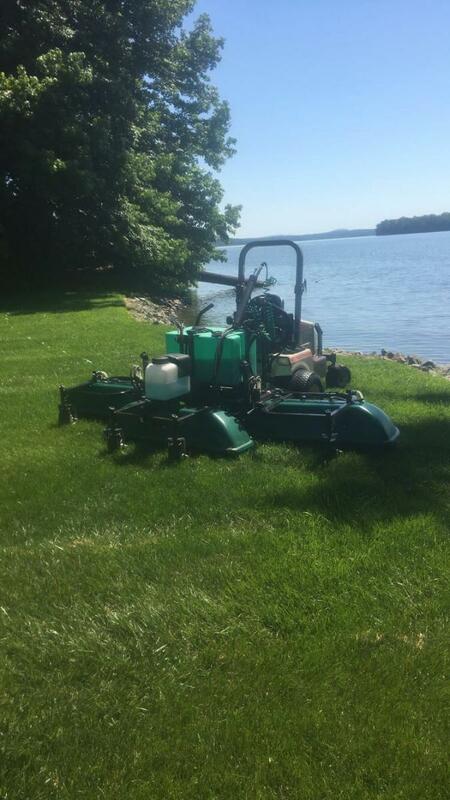 "I purchased my ProLawn Three Section shielded sprayer 8 years ago. Other than replacing a few minor wear parts, it is still going strong. One of the main reasons I purchased a ProLawn sprayer was for the safety it provided me while putting down my application. I use to apply herbicide with a hose and reel spray system. After developing some health issues related to breathing in the mist created by this type of system, I decided to purchase the ProLawn shielded sprayer after researching online and talking with my local Grasshopper dealer. The shielded sprayer has many advantages over hose and reel sprayers and also boom type systems. One of the main advantages as mentioned above is the safety for the operator. Because it is shielded you don't have to worry about breathing in any airborne chemical. Other advantages include direct contact to the weed, no over spray on plants in beds, and because of no drift you don't have to shut down your operation when it's windy. You can also add a fertilizer spreader to the unit to increase your efficiency. The owner Randy is also top notch. He is just a call away to help with any question or problem you may have." "ProLawns Shielded Sprayers have been the best investment my company has made. The shielded sprayer hooked on our Grasshopper mowers has increased productivity and the time it takes to spray large open properties. We have the Three Section sprayer and the sprayer puts down uniform spray with nearly zero spray drift. Randy has always been very helpful if we needed any parts or accessories, which is a great asset. Do yourself a favor and buy a ProLawn Shielded Sprayer. You will not regret it." "Being in Nebraska, we have terrible wind and it is against what is permitted to spray when the wind is over 10 mph without a hooded sprayer. My ProLawn Sprayer gives me the flexibility to do my job without worry of drifting. Randy and the ProLawn Company, has made my life easier knowing I can do my job without worrying about harming the other plants and flowers. Love my sprayer!" "The Drop & Drive saves a lot of time not having to get off my machine or bend over to put stakes in every corner. The Drop & Drive is light weight, easy to use, and securely sticks the placards into the soil without getting chemicals on my hands or putting stress on my back. I wish I would have had this 30 years ago. Great product and highly recommend it!" "I just wanted to thank you guys for introducing my company to your shielded spray system. It is without a doubt an upgrade from the open boom system we previously used. ProLawn's shielded booms help my applicators feel more confident applying near gardens and landscape beds and they certainly appreciate the fact that they are less likely to experience drift. Lastly, l want to comment on what great coverage we get with the ProLawn. We have experienced less call backs on tough weeds and seem to go through less herbicide as well. Thanks again for a great product!" "I have been using the Prolawn Spray Shields for several years now and they have been extremely helpful for all the spraying we have done. We have ours attached to the front of diesel powered lawn mowers. We're able to cover a lot of ground and get great coverage. The shields help protect us from the occasional wind gusts, and the design works great for easy transport of the sprayer." "I love the ProLawn unit, it has saved my feet, knees, and my back. Saves me time, money, chemical, and has increased our productivity like you wouldn't believe. With the 3 section booms folded up, it can fit anywhere a 52 inch mower can fit and I can get through normal to wide size gates. The shields and curtains on the ProLawn shielded sprayer enables me to get right up close to annuals, perennials, anything in the beds. I have no drift at all and windy days don't bother me. I've used and seen other machines designed to do what this one does, but nothing can do it like the ProLawn's unit. With the open boom sprayers out on the market today, you are going to have big droplets coming out of those sprayers and you are going to miss a weed. It can only hit one weed at a time when the big droplets are coming out, but with ProLawn's unit it's a fine mist and it's going to hit every single one. You won't have call backs and I don't have customers canceling on me, never had it happen. My lawns don't cancel for how they look because I make sure they look great with this machine. I produce more now in my 50's than I did in my 20's. I won't ever have to stand or walk all day spraying lawns again. Thank you ProLawn!" "We purchased our commercial ProLawn Shielded Sprayer in 2016 and could not be happier with the performance of this piece of equipment. We are able to spray much faster and precise than ever before. We were previously using a tank pull behind sprayer and could not spray unless the weather was perfect. We never have to worry about a windy day with the protectant shield and mist that this tool produces. We are able to use less chemical on a customer’s lawn with better results saving us time and the customer money. Along with this sprayer, we also purchased a foaming attachment to help us determine exactly where we had treated to prevent over treating and waste of chemical. I would highly recommend this quality equipment to anyone in the market for a commercial sprayer. We have been so pleased with the equipment and the time that Randy has spent with us to always be helpful in answering any questions we have had. I would give ProLawn products five stars (*****). Here's a picture of my unit below. Enjoy!"